While most people do some gardening, caring for roses seems to have a reputation as being difficult, complex, and time consuming. Nothing could be farther from the truth although there are some tricks to dealing with these beautiful plants. Roses require free air circulation, sun, and a well-drained acidic soil with a pH of five or six. They do best with eight hours a day of full sun, however in very hot, dry climates the roses should have some shade in the late afternoons to keep them from scorching. They should not be planted too closely to a building because they will have a tendency to mildew, and if there is a cement slab foundation it can change the pH of the rose bed. A three foot space between the rose bed and the building will be sufficient to keep the roses healthy, and will make it easier to repair and paint the building. When preparing the bed, soil should be trenched and loosened to a depth of two feet. A mixture of half rotted manure and compost should be combined with the soil from the bed and then returned to the rose bed. Allow this mixture to settle for two weeks before planting the roses. Roses need good drainage, so if the bed is located in an area where this is a problem, dig the bed as above, but lay down about two to four inches of pea gravel in the bottom of the trench and then fill with the compost mixture as above. If drainage still proves to be a problem, a French drain may need to be installed or the rose bed relocated. 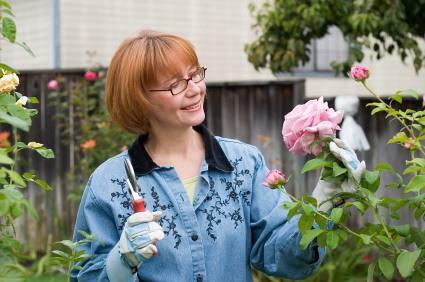 When it is time to plant your roses, dig the hole slightly larger than the spread out roots of the plant, and it should be deep enough to barely cover the bud graft. Soil should be mounded up slightly in the center of the hole to allow the plant to be firmly seated on it. Prune off any damaged roots and remove a small amount of the tips of several roots. Half fill the hole with soil, and pour a pail of water into it. Allow the water to be absorbed and then fill the hole with the rest of the planting mixture, and tamp down firmly. Prune any straggly canes to six inches above the soil level. Planting the bushes is not the end of gardening. Caring for roses continues on a regular schedule throughout the growing season. Roses need plenty of water during dry seasons. Rather than small, frequent waterings, the roses should be watered at one-week intervals in a large amount. The weekly watering should reach the deepest roots. If it is done during the morning hours there will be less of a chance of the bush contracting mildew. Keep the leaves dry if at all possible, using a slow trickle of the hose rather than overhead watering. Thick mulch, mixed with a nitrogenous fertilizer, will help the plant thrive during a hot, dry summer. October 1 in the southern states. If the temperature tends to fall below ten degrees in the winter, then roses will need protection. Mound soil around the plant to a depth of eight inches. Draw canes up and trim to a length of thirty inches. After soil has frozen, mulch with a mixture of straw, manure, and compost. Burlap may be used to shield the beds against strong, dry winter winds. The mulch and burlap should be removed at the first sign of spring. Healthy roses can usually ward off diseases and pests; however, roses that are weakened by bad growing conditions can succumb to several diseases and insects. During the early spring always rake mulch and debris from the base of the plant to cut down on fungus, and insect infestations. Leaves that yellow, or fall from the bush during a normal growing season probably are infested with disease or insects and should be removed from the area. Leaves that are on the shrubs that show signs of disease should be removed and disposed of. Always wash your hands before touching another rose bush. If you happen to be pruning a diseased bush always disinfect shears and other equipment before moving on to the next plant. There are many things that are pleasant about gardening. Caring for roses is a fascinating, and satisfying hobby. It produces a lot of beauty with just a little investment. Find which types of roses are best for your area and begin enjoying their beauty and fragrance today.